Signal lamp LTE-5061, 220VAC, green, with screws Signal lamp with supply voltage 220 VAC, power 2 W and green color. Signal lamp LTE-5061, 24VDC, green, with screws Signal lamp LTE-5061 with rated voltage 24 VDC and power 2 W, green color. List Price 24.90лв. VAT Incl. 23.66лв. VAT Incl. 22.41лв. VAT Incl. 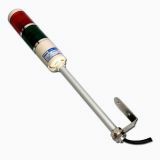 Signal tower, LTA205-2T, 24 VDC, 5 W, red / green LED signal tower two-colour LTA205-2T, 24 VDC, 5 W, red / green. List Price 29.00лв. VAT Incl. 27.50лв. VAT Incl. 26.10лв. VAT Incl. List Price 29.90лв. VAT Incl. 28.40лв. VAT Incl. 26.91лв. VAT Incl. Rotating signal beacon, LTE-1121, 24 VDC, 10 W, blue Rotating lamp with power supply 24 VDC, power 10 W, blue color, built-in reflective module. Mounting of the clamping is done with screws. Signal lamp 24 VDC LTE-5061, strobe, red LED red signal lamp 24 VDC LTE-5061, strobe. LED Signal lamp, 12 VDC, 2 W, LTE-5061, strobe Signal LED (mini) with red color, nominal voltage 12 VDC, power consumption 2 W.
LED Signal mini lamp, 220 VAC, 2 W, LTE-5061, strobe, red Signal LED (mini) with red color, nominal voltage 220 VAC, power consumption 2 W.
LED Signal mini lamp, 24VDC, 2W, LTE-5061, strobe, yellow/amber Signal LED (mini) with yellow color, nominal voltage 24 VDC, power consumption 2 W.
Signal lamp, 220 VAC LTE-5061, strobe, amber Signal LED (mini) with yellow color, nominal voltage 220 VAC, power consumption 2 W.
LED signal lamp, 12 VDC, 2 W, LTE-5061, strobe, amber LED yellow signal lamp 12 VDC, 2 W, LTE-5061, strobe. Signal rotary lamp, 12 VDC, 10 W, LTE-5103, amber Rotary warning light with yellow color, nominal voltage 12 VDC, light output 10 W and reflective module. Rotating signal LED lamp, LTE-5103, 220 VAC, 3 W, yellow Signal lamp with rated voltage 220 VAC, 3 watts power, rotating reflector and intended for stationary installation. Signal lamps are designed to be used in moving vehicles, stationary machines and systems for control and display. They can be rotating with reflector, flashing and with a siren. The devices are mounted stationary or by a magnet on consoles, desks, moving elements or directly to the machines. Warning lights and columns are widely used in all areas of industry and households.